God speaks to me in the most random ways. I think He does that so I don’t get use to Him teaching me in any one way. He is like, “Sarah, watch out I’m gonna teach you something here at this lacrosse game. Hey girl, there is a lesson waiting for you in the grocery store.” This is why I have to be on the look out, because He will use every opportunity and every circumstance to teach me who He is. This weekend I was teaching the Kindergarten class, and boom, there He was. 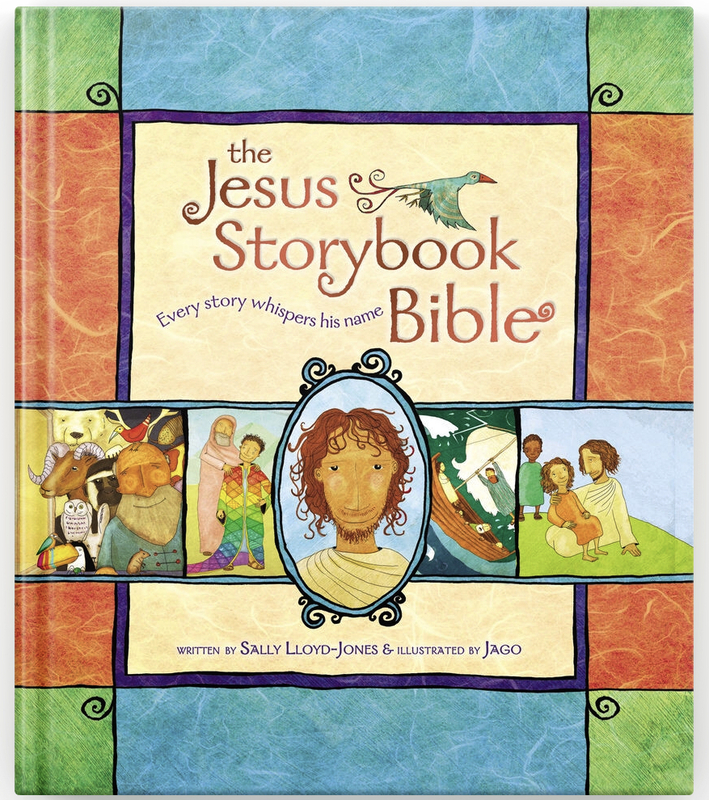 The lesson for the day was “The Terrible Lie,” from the Jesus Storybook Bible. I got everyone to sit down on the carpet for story time. I was thinking, “Man I am going to read this with such gusto these kids are all gonna be saved and want to get baptized.” But, that was not the case because pretty quickly into the story God was knocking at my hearts door and I forgot to read with salvation producing gusto. This part of the story is a retelling of the fall of man. 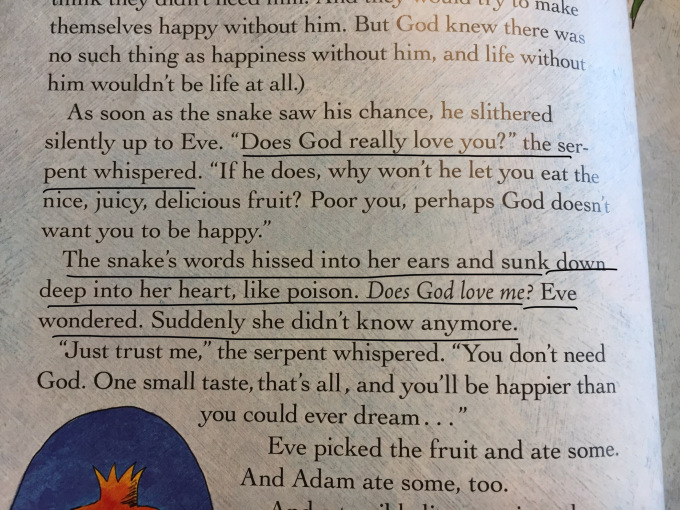 How satan deceived Eve, and Adam was led by his wife into sin. From that time every human born is born a sinner in need of salvation. Don’t believe me? Have you ever met a toddler hell-bent on getting his way? Exhibit A: a sinner from birth. I love the bible because from the fall of man, the entire story is the story of how God redeemed His beloved creation. I was so struck by these words. I have always understood that Satan was attacking God’s character with his questions, but until I read this I never really understood the heart of the issue. He is getting her to question God’s love for her. I had to go back and look at the big pants, adult, grown up, scholarly text to compare it. 6 The woman was convinced. She saw that the tree was beautiful and its fruit looked delicious, and she wanted the wisdom it would give her.So she took some of the fruit and ate it. Then she gave some to her husband, who was with her, and he ate it, too. 7 At that moment their eyes were opened, and they suddenly felt shame at their nakedness. So they sewed fig leaves together to cover themselves. Tyndale House Publishers. Holy Bible: New Living Translation. Carol Stream, IL: Tyndale House Publishers, 2013. Print. As I follow the conversation here I see that satan is trying to get her to see that God is holding something good from her. Satan is throwing ulterior motives out there. The true motive was to protect Adam and Eve and test their faith. Satan is saying, “How can you love and trust someone who is just trying to stop you from being as good as they are? He doesn’t really love you, he just wants you to be lesser than him.” And Eve bought it. And so did Adam. Good God in heaven. I can’t wait to talk to Dana, my counselor today and tell her I have figured out what my problem is and I don’t need anymore therapy! (To which everyone who knows me says, don’t cancel your future appointments yet.) Whenever the going gets tough, instead of trusting God’s word, I believe a lie that was born in the garden: God doesn’t love me. It’s so simple and yet so profound. 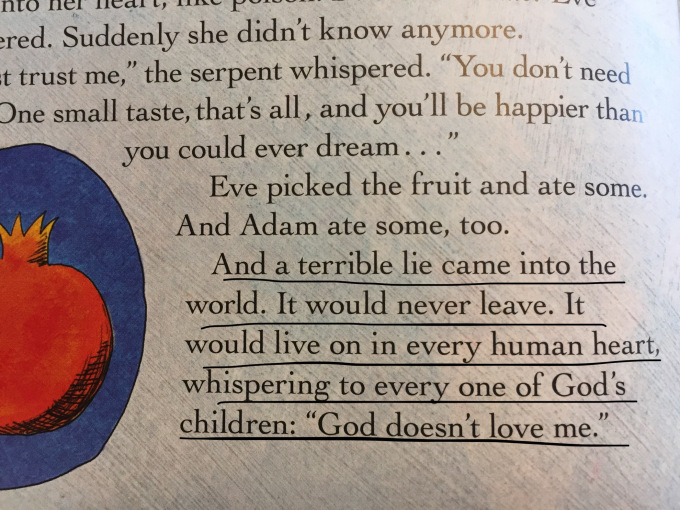 The ENTIRE bible is about how God loves me and yet I trade 66 books of the bible for one lie that happens in the first book. The crazy thing is I didn’t even know the depth at which I struggled with this until reading this book to some cutie pie kindergarteners. This is at the heart of every conflict, every freak out, every committing to something to impress God and people, every attempt to feel worthy, every attempt to make God love me more. I believe this lie and so I act like God doesn’t love and that I have to earn His love. 38 And I am convinced that nothing can ever separate us from God’s love. Neither death nor life, neither angels nor demons, neither our fears for today nor our worries about tomorrow—not even the powers of hell can separate us from God’s love. 5 And this hope will not lead to disappointment. For we know how dearly God loves us, because he has given us the Holy Spirit to fill our hearts with his love. 8 But God showed his great love for us by sending Christ to die for us while we were still sinners. Understanding that He loves me is so important because it is what motivates me to follow Him and do what He asks me to. If I don’t know He loves me than I am nothing more that a performing hippo in heals trying to impress God to earn His love. Guess what, that gets old real fast. Responding and doing things because He loves me is empowered by the Holy Spirit, that does not get old, ever, Yes and Amen! One more thought. IF God wanted performing hippo’s in heals, He would not have had to send His Son to the Cross to die for the sins of the world. If we could somehow earn His favor and Love then satan was right in the garden, God doesn’t love us, we do have to earn it. But He DID send Jesus to the cross. He DOES love us. He WANTS you to believe in His word and live like you are loved by the creator of all the heavens and the earth. I want that for myself. I want to live believing the 66 books of the bible that talk about how much God loves me, and NOT believing one stupid lie from dumb snake. Older PostGirl's Trip 2018, Yes and Amen!